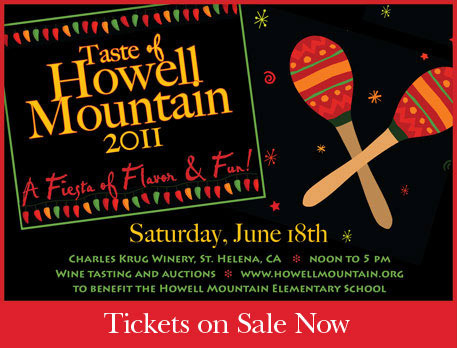 Angwin, CA – HMVGA President Frank Dotzler of Outpost Winery announced today that a special consumer wine tasting, Taste of Howell Mountain, will be held in conjunction with a charity silent and live auction on Saturday, June 18th at the Charles Krug Winery, 2800 Main St. in St. Helena. Currently available wines will be showcased by 32 wineries who are members of the association. Aside from being the first sub-appellation within Napa Valley to be officially recognized by the federal government, Howell Mountain is also one of the most exclusive and sometimes elusive of appellations. Production from primarily family-owned wineries is quite small, though of notoriously high quality, and the wines are sometimes hard to find on store shelves. That circumstance renders this once-a-year only consumer tasting even more special as guests will be able to sample current release wines from nearly all the mountain’s producers. During the wine tasting from noon to 5 pm, there will also be a silent auction of dozens of wines and other interesting items for bid from noon to 3 pm. This will be followed by a live auction upstairs in the Carriage House at 3 pm. The live auction includes a line-up of 29 auction lots featuring many “wine lifestyle events” such as weekends in wine country and special, private events at member wineries, an fly fishing trip at Mammoth Lake, not one but two library vertical collections from Randy Dunn going back to 1982, a great farmer’s-market-to-table Julia/Julie day for foodies, large format wine bottles, etc. Proceeds from both the silent and live auction go to the Howell Mountain Education Foundation which benefits the Howell Mountain Elementary School in Angwin where the student population has doubled in recent years. A major renovation of this tiny school founded in 1886 was completed three years ago, only to find that enrollment filled the new school to overflowing! Now in its 15th year, the Taste of Howell Mountain will be held in the newly remodeled historic Carriage House at the Charles Krug Winery hosted by the Peter Mondavi family. With its sweeping lawn and gracious Carriage House building, it is a natural and enjoyable setting for this casual event which includes gourmet appetizers as well as an amazing slate of wines. This year’s theme is Fiesta! and it promises to carry on the tradition of casual elegance, great wine, and good company. A full list of the wineries pouring is below. Tickets are $125 per person and are available now online at www.howellmountain.org or you can order by phone at 707-965-2665.